Grading and Excavating Contractor | John E. Jenkins Inc. Whether a job requires massive earth movement or site-specific excavation, our process remains unchanged. Our team of experts and cutting-edge technology combine to allow us to successfully plan and execute on any size project. 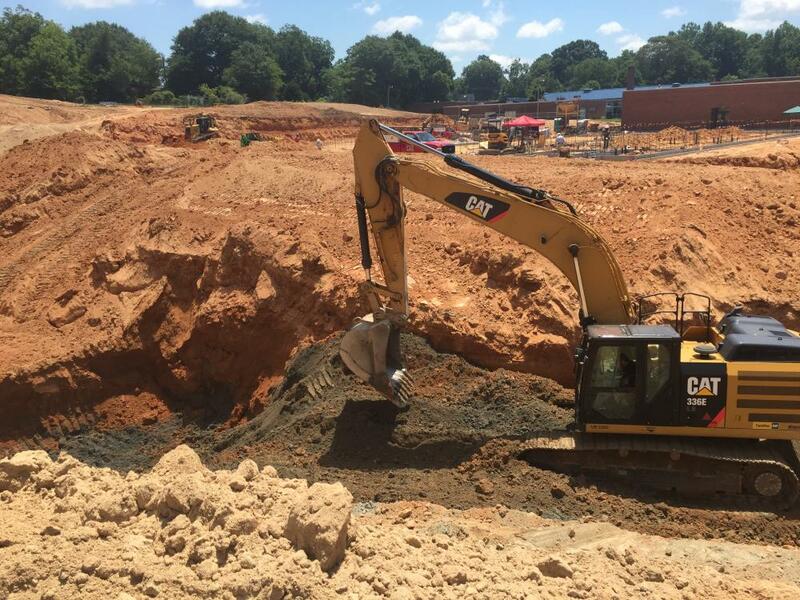 At the start of every mass grading and excavating project, our project managers, job foremen and superintendent collaborate to confirm takeoff quantities, cut-to-fill measurements, schedules and proper assignment of equipment and operators. Our fleet of GPS-enabled grading equipment allows us to put to use some of the most advanced technology on the market today. With our intelligent machine-control excavators, we load excavation plans into the GPS technology powering the machinery. This allows us to minimize over excavation and digging below the target surface while achieving the ideal finish grade. We also use bulldozers with grade control technology for cut and fill, often eliminating the need for costly and time consuming site surveying, staking and frequent grade checks. Ideal for bulk material spreading, mass grading and finish grading, these dozers allow us to real-time compute grade adjustments with millimeter accuracy. During both bulk and trench excavation work, we use advanced technology for accurate cut and fill that achieves the final elevation within the specified area. During a fill operation, we account for the swell and shrinkage with proper compaction to ensure the mass grading work can begin without interruption. With industry leading technology in the field, we increase productivity and efficiency on all jobs which reduces costs and time spent on the job. Talk with someone from our team about partnering with John E. Jenkins for your next grading and excavating project. Contact us today!